Is Granola Cereal Good for You? Hannah Lane has been writing since 2010, specializing in nutrition-related articles. Lane holds a Master of Public Health in health promotion from George Washington University, and is currently pursing a PhD in human nutrition and exercise from Virginia Polytechnic University. Determined to conquer her own clumsiness, Lane has become an avid runner, biker and aspiring yogi. On the surface, granola cereal might seem like a healthy food choice. The primary ingredient, whole-grain oats, packs a big fiber punch and supports digestive health. Nuts and seeds provide a heart-healthy source of dietary fats, and dried fruits add natural sugar to satisfy your sweet tooth. However, granola's health benefits can be masked by cereals loaded with added sugar and artificial ingredients. Additionally, the dense ingredients contain more calories than may be expected. It's essential to check the nutrition contents to find granola brands that best preserve the nutritional value of granola without loads of unhealthy ingredients. Consider its high caloric content, too, when determining serving size. While the main ingredients in granola — oats, nuts, seeds and dried fruits — can be both delicious and nutritious, many store-bought granola brands contain added sugar and artificial ingredients. Check the nutrition information and serving size before choosing a granola. When shopping for granola cereal, inspect the sugar and fat content as well as the overall ingredients list. Many granola brands, even those that are considered healthy, contain lots of added sugar that don't contribute any nutritional value. Avoid products that list many sources of sugar in the ingredients list, sticking to those with sugar content derived from dried fruit or honey. Products that are low in calories or claim to be "low-fat" or "sugar-free" often eliminate the healthiest ingredients to make this claim. Before purchasing these items, consider what health benefits might have been sacrificed. Many products, even those touting "all-natural" ingredients, can contain unhealthy trans fats, artificial coloring, and preservatives, so check the label carefully before buying. In addition to checking the labels for nutrition information, also compare calorie content and serving size. Granola is loaded with many nutrient-dense ingredients, which provide the consumer with plenty of health benefits and energy but also increase the calorie content. According to the National Heart, Lung and Blood Institute's 2013 report, Maintaining a Healthy Weight On the Go, just 1 cup of homemade granola contains approximately 500 calories and 55 grams of fat, much higher than the average breakfast cereal. 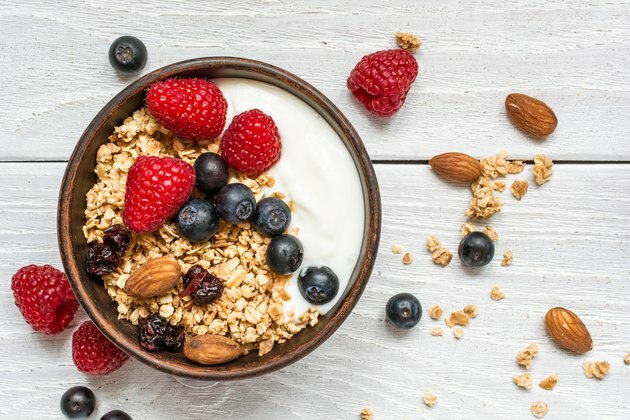 The NHLBI report recommends replacing granola with lower-fat and lower-calorie options such as oatmeal or bran flakes if weight control is a concern. The recommended serving size of granola is smaller than comparable breakfast foods because it's packed with nutrients. Be mindful of this when purchasing and consuming granola cereal. To preserve the health benefits of granola cereal, try a homemade recipe rather than purchasing it at the store. You can find any combination of raw ingredients including oats, nuts, and dried fruits at a health food store or farmers market. Customize the ingredients to suit your tastes and avoid consuming all that extra, artificial stuff found in many store-bought granola brands. Seek out healthy, creative recipes, tips, and tricks for making homemade granola on food magazine websites. Granola can have a place in a healthy diet because it contains a high percentage of the daily recommended intake of fiber, protein, and other nutrients. But it's essential to be mindful of artificial ingredients and to consider the high-calorie content before consuming it regularly. Enjoy granola cereal in moderation and in its most natural form as part of a healthy, balanced diet.